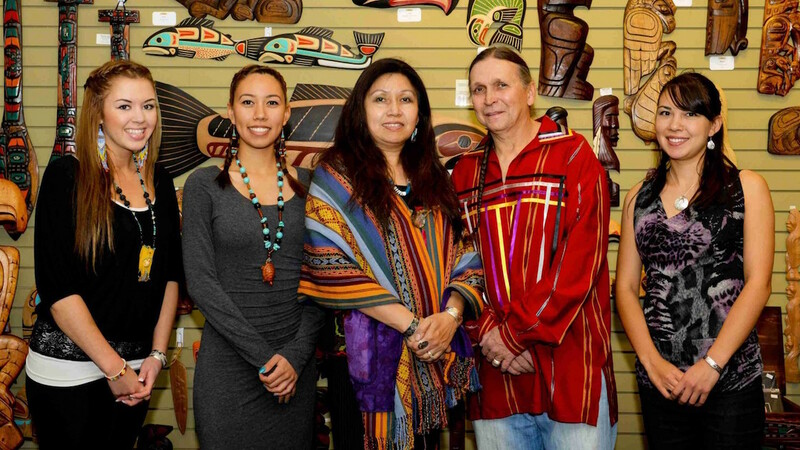 Cheryl’s Trading Post is an independent Native family owned, operated, and staffed business selling authentic handmade Native art. We focus primarily on local Northwest Coast Native Art. We also have products from across Canada and the United States, as well as Mexico, and Central and South America. The artists we work with are traditional people that practice their cultures and fulfill their responsibilities. The artists, the staff, and ourselves deserve to be compensated fairly for our work. And our customers deserve the highest quality work at the most reasonable prices possible. We are working to make this a positive experience for everyone. Cheryl (Morgan) Gregory is a Gitxsan woman born on the Skeena River. She grew up living a traditional lifestyle of hunting, fishing and gathering on her traditional territory. She is member of the Killer Whale Clan, and of the House of Woosimlaxha. Her family on both sides is of the line of Hereditary Chiefs. Her mom holds the name Woosimlaxha. The name has been passed down through her family matrilineally since time immemorial. Cheryl earned an Associate of Arts in Indigenous Government Studies, a Native Family and Community Counseling certificate, a Business Administration diploma, and a Master of Neurolinguistic Programming. She has worked in various administrative positions in the Native and Women's Communities. Cheryl is a dedicated mother, wife, and stepmother. She is also active supporting her larger family and community.